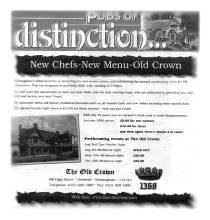 Built in 1368, The Old Crown is not only Birmingham's oldest hostelry, but also the City's oldest building. Following the £1.7m refurbishment programme, owners Oakcombe Limited appointed Metropolis 2 to develop and implement communication strategies, focusing upon 'theme' events. One of the key features of the venue is its age, enabling customers to literally drink in the history of the building. Metropolis 2 believed that its heritage should be the basis for the programme of events and developed a programme to include anniversary celebrations such as St George's Day. The first step was to create an event which would be a fixture in the diaries of local people and companies - a mediaeval night scheduled for the second Friday of every month. Metropolis 2 worked with the head chef to create a menu which reflected traditional English fayre via exciting flavours and ingredients. It also identified an historical re-enactment group who would stage knights locked in mortal combat in the courtyard to the rear of The Old Crown and a musicians' troupe who made authentic instruments and entertained the diners with period music and songs. Having set the scene, Metropolis 2 created support literature and a local media advertising campaign to whet the appetite. It invited leading food and entertainment critics from the media to attend the first event. The first event generated acres of positive coverage and comment in the print media and gushing but deserved praise on the airwaves. Demand was so high that holding the event once a month was not sufficient so, in addition to the monthly event, there are several events for individual parties and corporate clients. The corporate activity resulted in an explosion of regular dining activity with word of mouth recommendation galvanising people to visit The Old Crown.